One last post about my trip! 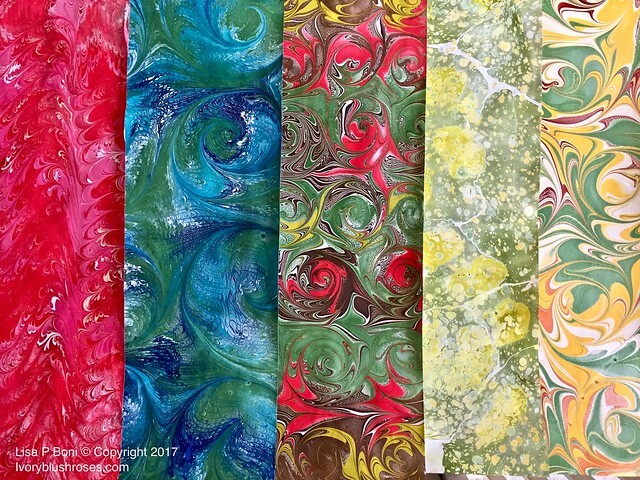 I didn't get to share much of my marbling class with you before as the papers I had created were rolled up tightly and not easy to photograph. But after spending a few days weighted down, they've flattened nicely and I'd love to share more with you about them! 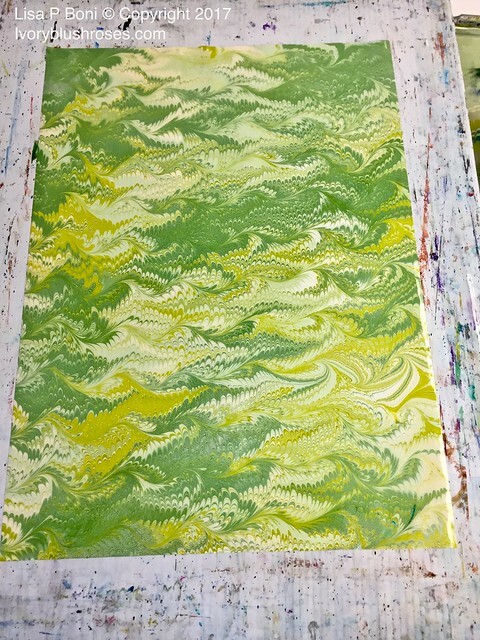 This batch was among some of the early papers that I marbled. The third from the right is actually the first one, but then it was later over dyed! I loved the way it turned out! Our instructor was Pat Thomas, and she was terrific! She allowed me to take some process pictures along the way. 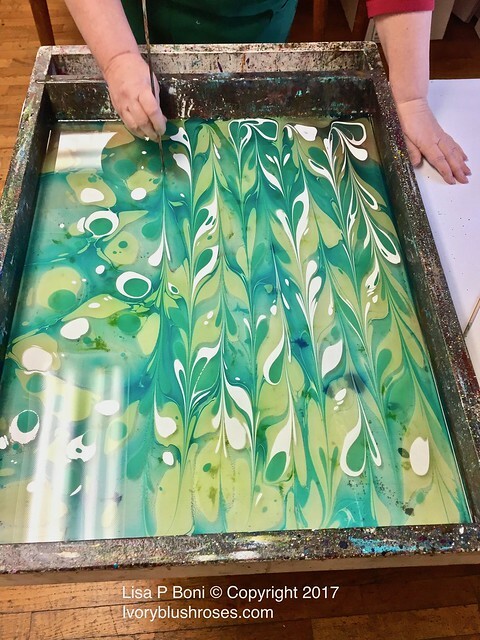 This is the tray filled with a solution of carrageenan, which allows the colors to float on top. The color is added a drop at a time and more added randomly. 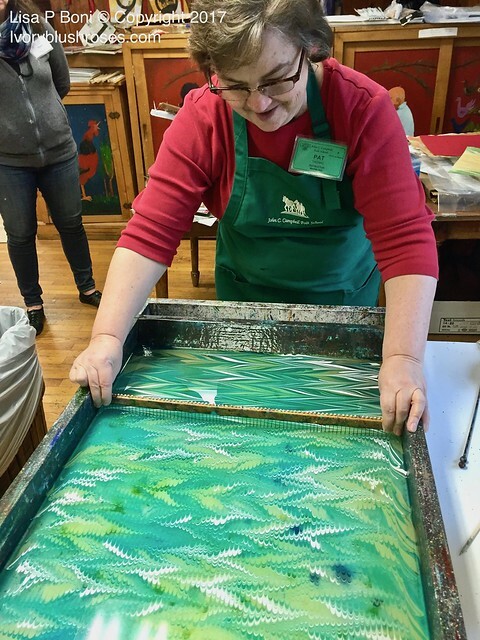 Using a bamboo skewer, lines are drawn through the tray, drawing the color into patterns. Then the skewer is drawn across the tray in the opposite direction, creating yet a different pattern! It's like magic watching the change take place! 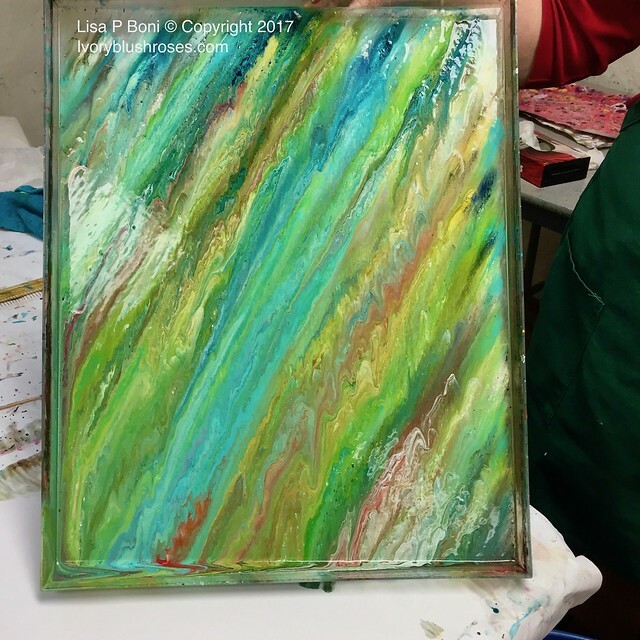 Then, a comb created with pins is drawn through the pan creating the traditional marbling pattern! 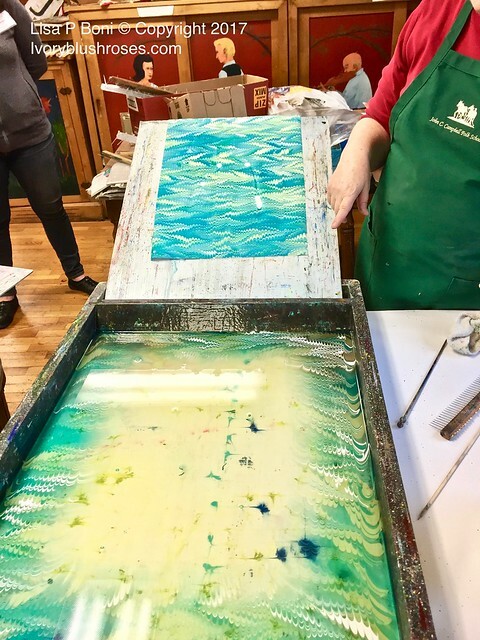 Next, a sheet of previously prepared paper is laid carefully on the surface of the tray and then lifted off revealing the "print"! 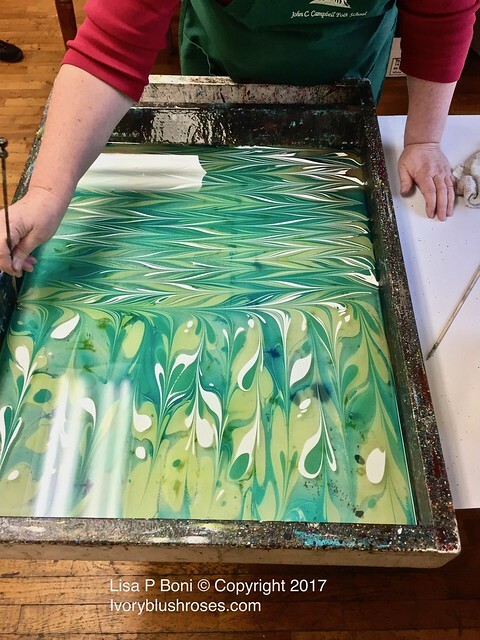 One of the things I learned is that what you see on the tray, may not be exactly what you will see on the paper as the color transparencies often impact the final result. Also, what you see on the tray is the bottom side of the color, not the "top" side that will show on the paper. 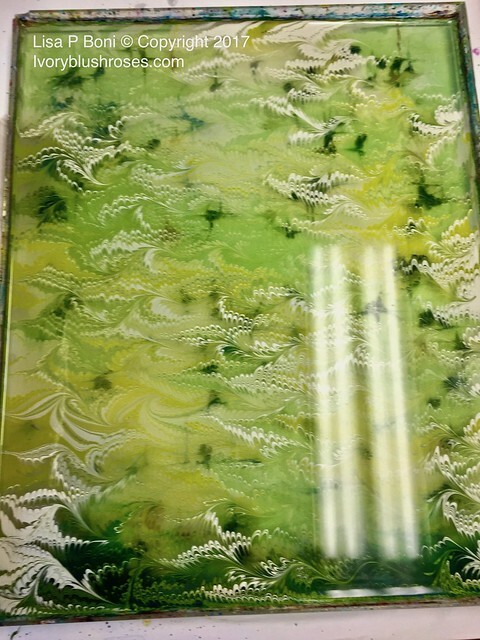 After Pat's demonstration, here is the tray I created. And the print that I got off of it! I had expected the darks to be darker, but because they were on the back and layers over more transparent colors, it lightened the whole. Still quite happy with how it turned out! Once we printed our papers, we clipped them up to dry. It was cold enough, that they were freezing rather than drying, so we ended up having to bring them in the classroom overnight, otherwise, we'd have had to pack wet papers! 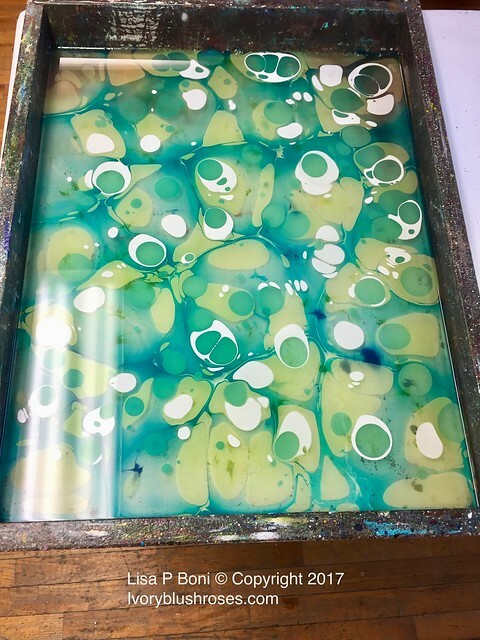 When we emptied the carrageenan solution out of the trays, it formed a lovely pattern of color on the bottom of the trays from where the paint had dripped through. Wish we could have printed this! But the carrageenan keeps it from adhering to the paper, so a photo will have to do! As most of you know, who read my blog regularly, I love green. They joked several times about needing to take the green paint away from me. But when all was said and done, I actually turned out quite a few papers with no green on them! The last morning, we choose one of our papers and created a booklet with it. Here is the class working hard at getting them completed! 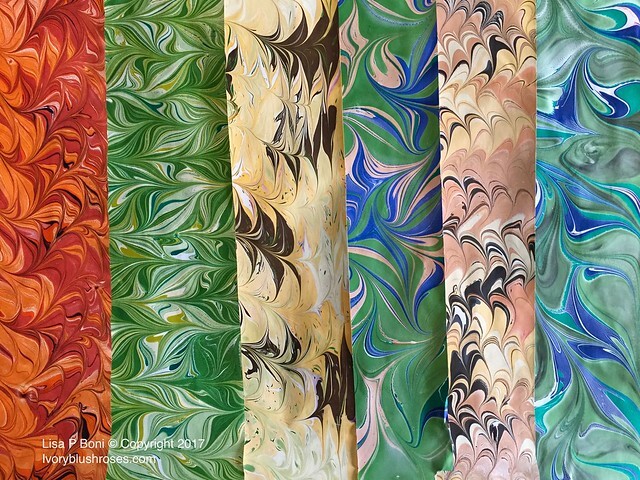 Ginny Moreland was the instructor for this portion of the class and Pat's class assistant for the marbling portion! She's also a wonderful marbler! Then, before our last lunch at the school, we had show and tell and a small "graduation" ceremony! 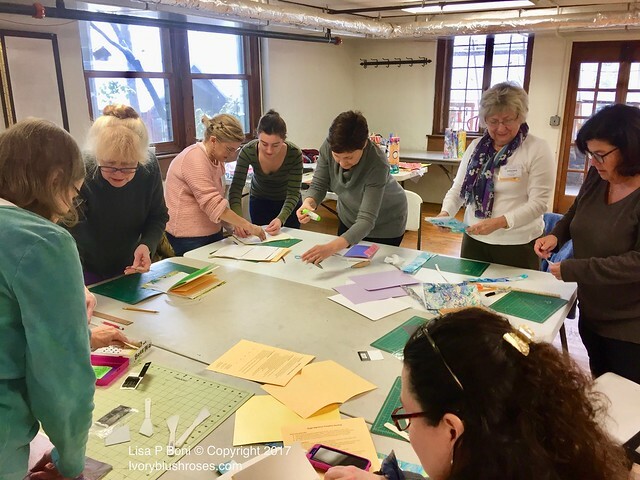 We only had Friday evening, all day Saturday and Sunday morning together, but what a fun filled time of learning it was! All the classes there turned out some lovely work ranging from making birdhouses, to spinning, to Morris Dancing, to making Italian Liquors and more. 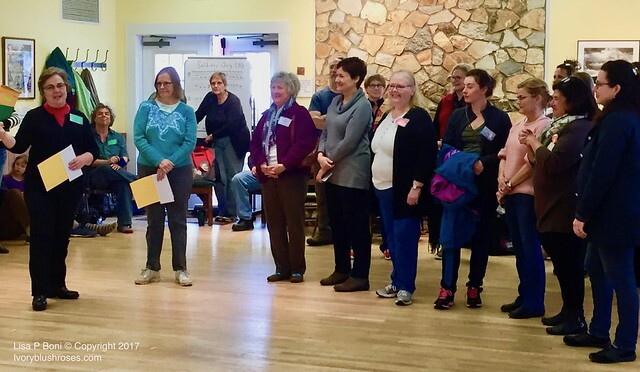 So much fun and a wonderful mix of men and women attending the classes! Along with our certificate, we received these bumper stickers! 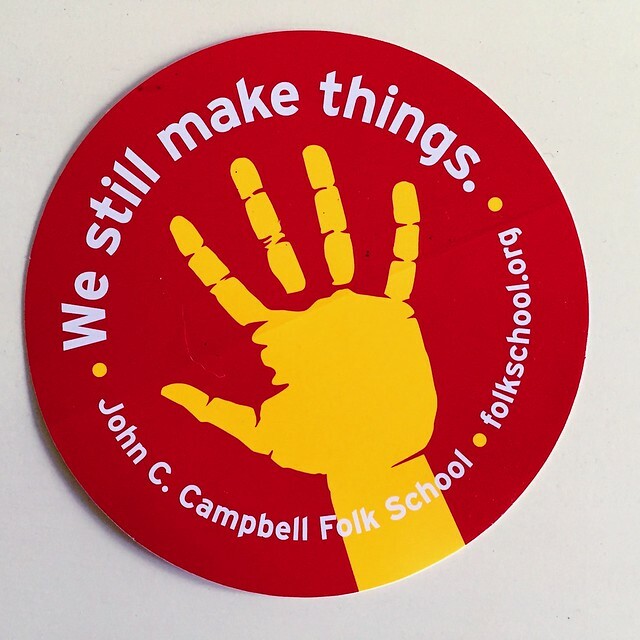 Do check the John C. Campbell Folk School out. It was a lovely experience and I would gladly return at any time to learn something new or to hone a craft further! So here are the papers I created during the class. This is about halfway through once I started getting the hang of it. By these papers, I was learning so much and having fun experimenting a little bit, both with color and with pattern. These were some of the last that I created. I love the way the pink and black ones turned out! 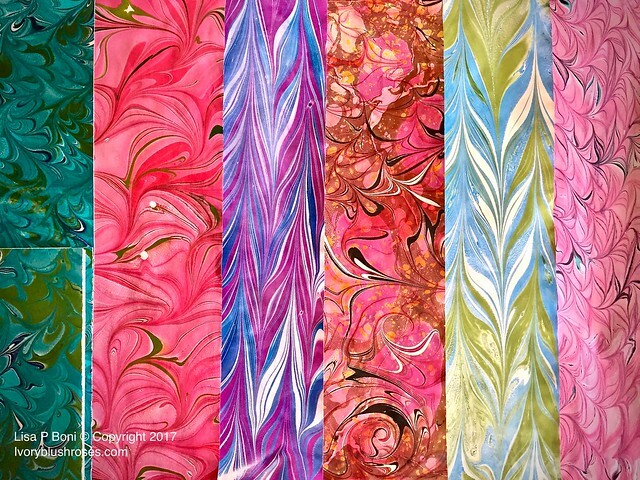 I definitely fell in love with marbling and by the end of the workshop was told that I had a knack for it! If nothing else, I could spend hours playing with it just to see how the colors interact and to see what one could do with the patterns! I was asked what I plan on doing with these lovely papers. Well, at the moment I have no specific plans, but I have done a bit of book binding, and the traditional use is to use marbled paper for the insides of the cover, so I may use some of them for that purpose. I may also use some of them to make note cards and possibly to make some small notebooks. Other than that, time will tell! The other question I received was about doing this process on fabric. 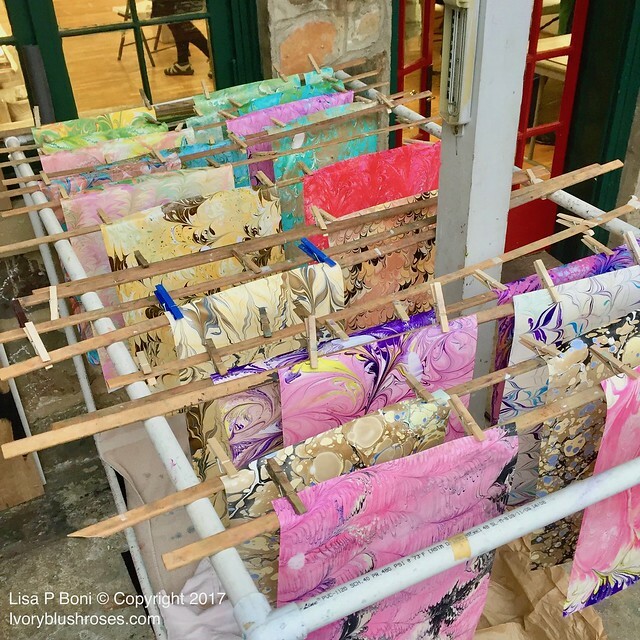 The answer is yes, you can, but it does involve a slightly different process and MUCH larger trays to accommodate the fabric! One of these days, I may give it a go on a smaller scale, but for now, there are so many other projects that I need to finish up before I can even consider adding a new craft to my regular repertoire! 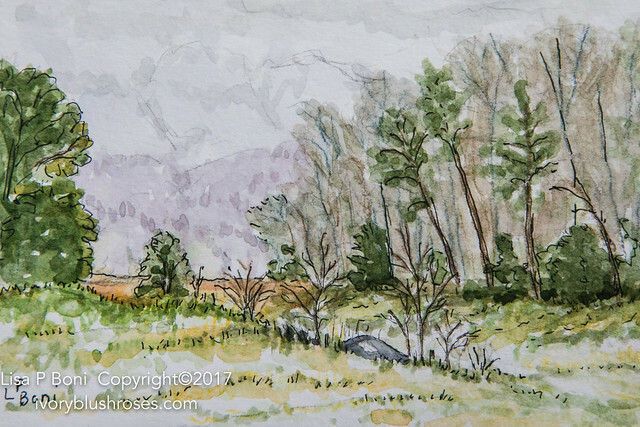 While on my trip through the Great Smokies, I did take time to do a couple of small watercolor sketches. 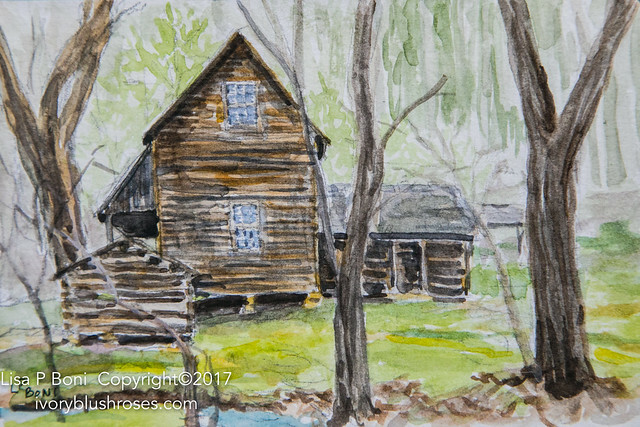 This one of some of the cabins in Cade's Cove. I loved how the dark woods contrasted against the lighter color of the woods behind them. The following day, I did this one of a meadow opening through the trees. The skies lowering and a bit of snow on the ground, but not enough to obscure the lovely colors in the grass. Both sketches are about 3"x 5". So that finishes up my 6 day trip to Georgia, North Carolina and Tennessee! I saw such a small portion of each state, but it whetted my appetite to see more! 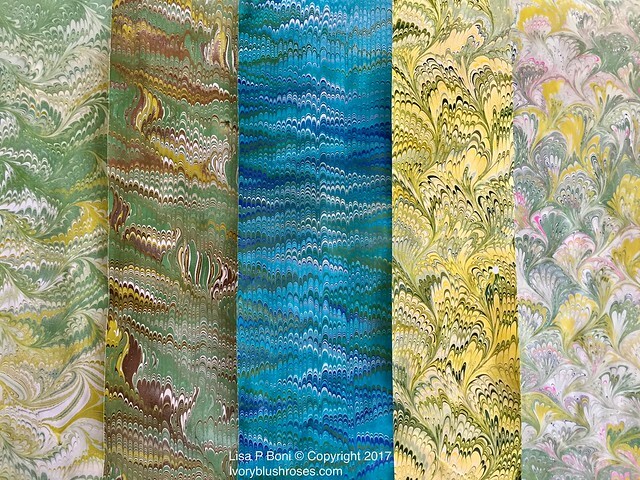 Dear Lisa ~ Your marbled papers are wonderful!!! What fun you had! You are so talented in different art forms. Your watercolors capture the peace of the areas. 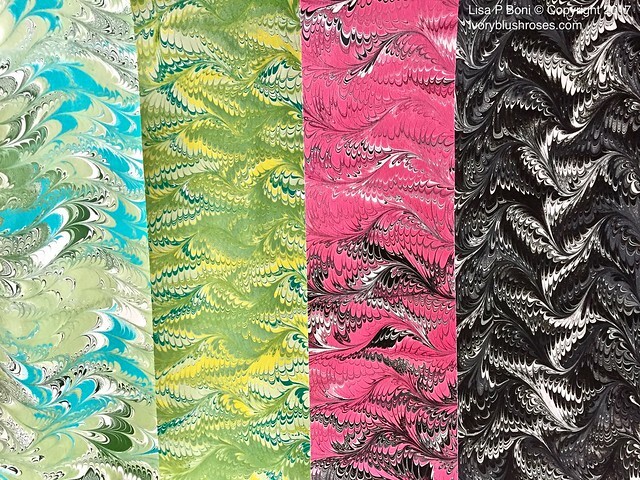 Wow Lisa, the marbled paper you created is AMAZING. You are a wonder!